I woke up this morning to find that Bryan and his mom had taken the car to buy king cakes--eight of them. 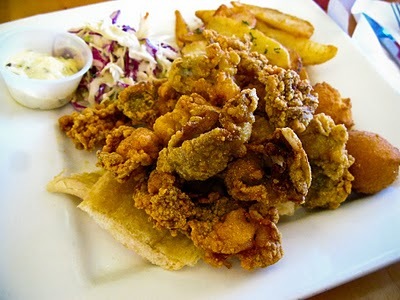 We went to New Orleans Hamburger and Seafood for lunch. Oysters. And so it begins: two items already crossed off my 'to eat' list. Today's big parade was Endymion, and we made arrangements to meet Bryan's cousins Rick and Judy and their family in "Mid-City". We thought they'd have good advice about where to park, and where to stand. (Bryan asked "So have you been parking in the same place for this parade every year for the last twenty years?" Judy thought for a moment and said "No, I think it's more like thirty.") Also, we like them. We waited in front of a huge building, still standing ruined and empty and paint-tagged five years after Katrina. The parade started at 4:15, and the first floats and bands reached us about two hours later. Here's an interesting side point about bands in Mardi Gras parades. Normal parades have well behaved crowds, obediently sitting on the curb, like we did for the parades of my childhood, politely waiting for a wave or a handful of candy. This is different. It's not that Mardi Gras crowds are BADLY behaved, it's just that they're crowd-y, and they actively push in toward the street, taking over the space, looking and waving and yelling and catching things. The out of town bands don't know how to control this, being from places like Wisconsin where people wait meekly at the curb, and they end up shoved to the center, the whole band in a sad little knot walking in the middle of the street, a three-lane marching unit reduced to a lane and a half, sort of in crisis mode, looking worried and bumping into each other as they play. So the NOLA high schools have BOUNCERS -- this is not a joke -- and they precede the band and they shove people back. "BACK TO THE LINE, PEOPLE, YOU'RE GOING TO HAVE TO MOVE IT BACK RIGHT NOW." Big guys and black women in track suits, out ahead. "KEEP IT BACK, PEOPLE." And then the band comes through, and the band DOES NOT GIVE UP this space, and the guys on the end walk that lane line and if you're in their way you're just going to get knocked down, or hit with a drumstick, BOOM BOOM BOOM right in the head. So they put the BIG kids on the outside -- the hefty burly band kids next to the pushing crowd, the little ones in the middle of the band, protected. And they keep that street, and it's THEIR STREET. 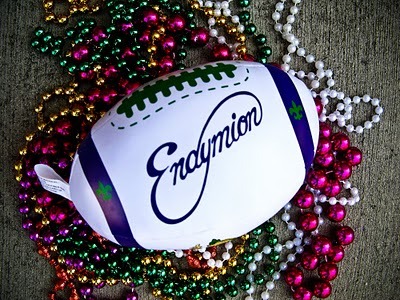 The special throws for Endymion this year were a special stuffed football (in honor of the Saints' great season) and a stuffed, embroidered penguin (because a baby bird was born on this day last year and named Endymion in honor of the krewe.) We caught enough beads to fill a huge bag, two of the footballs, and an amazing array of other junk: doubloons, cups, stuffed animals, a blinking necklace, fabric roses. Mandy didn't get the special penguin, in spite sitting on Bryan's shoulders and shouting requests for them at nearly every float. We'd only seen two penguins the whole time. They were pretty rare. After every float had passed, we turned to leave. Back to the last float, headed toward the car, Mandy was in mid-gripe about her penguin-less-ness when she squealed and pounced on something lying face down on a patch of bare dirt. It was a penguin. We got back to Metairie about ten, when the Isis parade was just reaching the spot a block away from the house. Mandy stayed with Aunt Dot while Bryan and I, along with his parents, walked down and waved at some more floats and got another half-shopping bag of stuff, including a couple of their special throws for this year.